To me, Spaghetti Aglio, Olio e Peperoncino is the Italian pasta dish that everybody should know and love. What makes this dish so successful is that as simple and uniquely Italian as it is, most of it’s main ingredients are found across a multitude of food cultures across the world. Garlic for example is fundamental in Asian, Middle East & European (and many more) cuisines. Anchovies in their cured form are found in various parts of Europe, Scandinavia and Asia to name a few. This dish transcends so many cultural bounds – for its familiarity of ingredients that are shared among them all whilst still retaining it’s strong Italian heritage and identity. I can comfortably say that Spaghetti Aglio, Olio e Peperoncino is my favourite pasta dish of all time. Not least because it tastes great – but also because I always have the ingredients on hand – and it’s so quick and easy to make. I don’t know the history behind this dish, but from the minimalist ingredients required, it may very well have started life as a simple ‘peasant’ food, evolving into the classic that it is today. And as we all know, simple foods are the best. I think everyone that cooks it will have their own tweaks that work best for them and therefore this recipe really works for me. Enjoy! Bring a large pot of water to the boil. Once the water has come to a rolling boil, add a teaspoon or two of salt. Don’t add the salt before the water boils as it simply delays the water boiling. What I like to do is add the pasta to the boiling water, let it come back up to the boil for 2 minutes, the turn the heat off and put the lid on. I then let it sit, fire off, for the remainder of the cooking time that it states on the packet. In the meantime, heat up a few tablespoons of good. extra virgin olive oil in a cold pan and add the Garlic, Anchovies & Chillies. The reason for starting with a cold pan is so the garlic doesn’t brown immediately. The goal isn’t to toast the garlic – just sweat it enough that it softens and releases its beautiful flavour into the oil. Toasting the garlic will still work however it will create a whole new taste to the dish. About the time the pasta has cooked (approx 6-8 minutes), the garlic mix should be done. 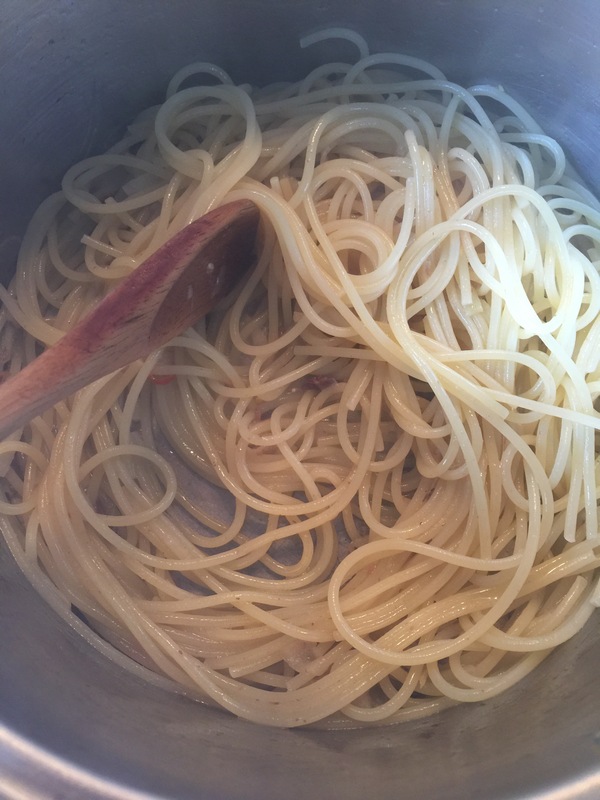 With the frying pan heat on low, add the pasta (without the water of course, whichever way works best for you) and pour in about half a cup of the pasta boiling water. 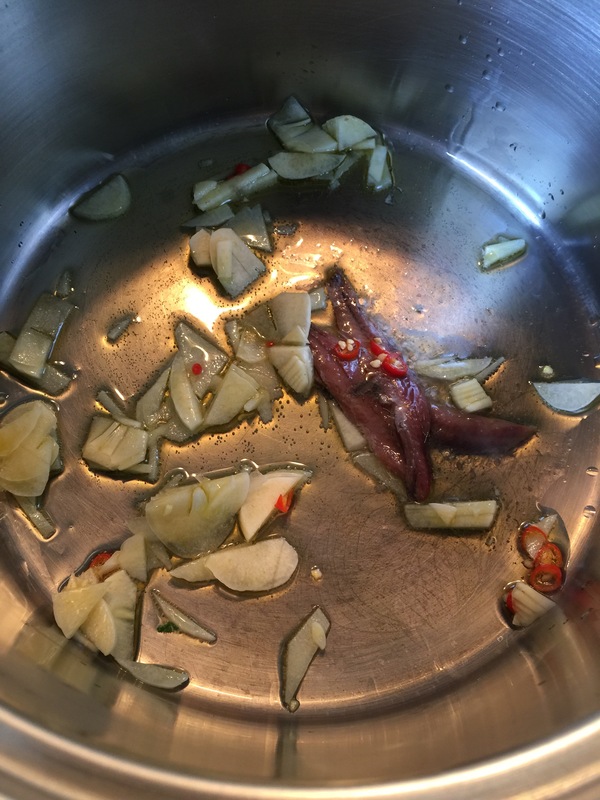 Stir this through until it evaporates & gets absorbed into the pasta. 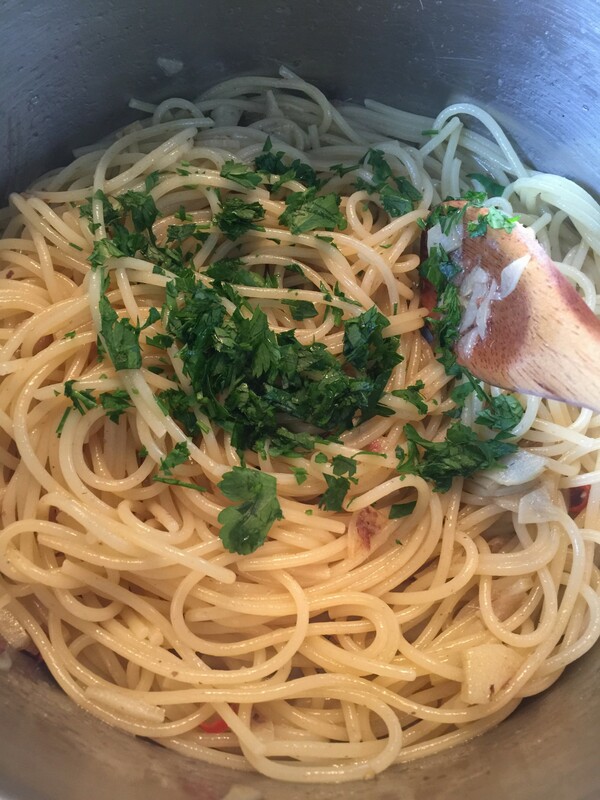 This adds a beautiful sheen and coating to the pasta and also helps it absorb the pan flavours. Think of it as deglazing. Taste and season as necessary. Next, add the chopped, fresh parsley and stir through. Finally top with as much freshly grated Parmesa / Grana Padano cheese as you like, add a drizzle of fresh, extra virgin olive oil, a sprinkle of chilli flakes, sit back and gouge your way through a plateful of deliciousness.